Prepared in the field and submitted by: Paul A. Mayewski Institute for Quaternary and Climate Studies University of Maine On behalf of the 2001-2002 US ITASE traverse team. 1. Upgrades to the older Challenger 55 to make it par with the new 55. 2. Purchase of two 3000-gallon fuel tanks mounted on a solid sled system to replace fuel drums for greater efficiency, cost-savings, and safety. 3. Purchase of a fifth Berco or if available from McMurdo another similar size sled to replace several less durable, lighter sleds. This item will not be necessary if item (2) is supported. 4. Retention of the New Zealand owned Alanaar sled for at least 2002-2003 as a heavy-duty fuel sled. This item will not be necessary if item (2) or (3) are supported. 5. A new permanent structure for working on equipment and berthing for four people to be mounted on an existing Berco. 6. LC-130 support for 2002-2003 is expected to be significantly less than for 2001-2002. 7. To reduce impact on South Pole Station in 2002-2003 US ITASE plans to stay 5- 10+ km outside of South Pole at its last work site for the season. US ITASE also plans to winter vehicles and sleds at this site. Finally, it is hoped that the success of the US ITASE platform for science can act as a model for future science logistics (e.g., a roving base camp, a resupply system for AGO sites, and future traverses in East and West Antarctica). US ITASE offers the ground-based opportunities of traditional style traverse travel coupled with the modern technology of GPS, crevasse detecting radar, satellite communications and multi-disciplinary research. By operating as an oversnow traverse US ITASE offers scientists the opportunity to experience the dynamic range of the Antarctic environment. US ITASE also offers an important interactive venue for research (currently eleven integrated science projects) similar to that afforded by oceanographic research vessels and large polar field camps, without the cost of the former or the lack ofmobility of the latter. More importantly, the combination of disciplines represented by US ITASE provides a unique, multi-dimensional (x, y, z and time) view of the ice sheet and its history. In its current four year cycle, US ITASE will sample the environment of West Antarctica over spatial scales of >5000 km, depths of >3000 m, heights in the atmosphere of >20 km, and time periods of several hundred years (sub-annual scale) to hundreds of thousands of years (millennial scale). During the first US ITASE field season (1999-2000) team members conducted a short shakedown program utilizing two Tucker SnoCats. Weather delays in McMurdo resulted in a short season and only 50% of the program planned for that season could be completed. During the second US ITASE field season (2000-2001) one Tucker SnoCat and one Caterpillar Challenger 55 were utilized. The SnoCat engine failed early in the season. After hauling the SnoCat back to Byrd Surface Camp loads were double-shuttled by the Challenger for the remainder of the season. By seasons end all of the work not completed during the 1999-2000 season was accomplished and ~90% of the 2000-2001 tasks were completed. This report documents the accomplishments and recommendations of the 2001-2002 field season. Two LC-130 fuel drops were made early in the season to provide JP8 fuel for the traverse. The traverse route planned for 2001-2002 extended 2000 km from Byrd Surface Camp to Siple Station and return. Early in the season it was decided to revise the number of site visits from 7 to 6 (deleting the farthest site Siple Station) changing the total traverse distance to 1825 km because of initial concerns over fuel consumption. By later in the season, however, we determined that the estimated fuel consumption estimate was correct and there would have been sufficient fuel for the originally planned traverse. As it turned out issues related to terrain and weather played the key role in determining the farthest point reached by the traverse. The farthest point reached by the traverse was 50 km short of site 6 and a straight-line distance of ~125 km from Siple Station. At this point sastrugi were encountered that were sufficiently large (~1m) to cause the sleds to heel to the point at which damage could occur to the structures on the sleds. To avoid damage to people, scientific equipment, and traverse equipment travel was limited to ~ 5km/hr (compared to usual travel speeds of 10-12 km/hr). We were unfortunate enough to also have encountered the sastrugi in flat light conditions limiting our ability to make detours around the sastrugi. Once stopped we experienced two storms that lasted a total of four days, with 30-65 knot winds that resulted in snowdrifts as high as 3m around vehicles and sleds. Forecasts provided by McMurdo indicated that we should expect at least one more storm after a short 24-36 lull between storms. We conducted as much science as possible and extricated the traverse line during the lull between the storms and began our 825 km return trip to Byrd. By this stage we had completed almost 90% of the traverse, and almost all of the science objectives. We decided that it was not worth pushing the traverse through poor conditions at the extreme limit of its distance from McMurdo Station. Two LC-130 fuel drops were made early in the season to provide JP8 fuel for the traverse. The traverse route planned for 2001-2002 extended 2000 km from Byrd Surface Camp to Siple Station and return. Early in the season it was decided to revise the number of site visits from 7 to 6 (deleting the farthest site  Siple Station) changing the total traverse distance to 1825 km because of initial concerns over fuel consumption. By later in the season, however, we determined that the fuel consumption estimate was correct and there would have been sufficient fuel for the originally planned traverse. As it turned out issues related to terrain and weather played the key role in determining the farthest point reached by the traverse. The farthest point reached by the traverse was 50 km short of site 6 and a straight-line distance of ~125 km from Siple Station. At this point sastrugi were encountered that were sufficiently large (~1m) to cause the sleds to heel to the point at which damage could occur to the structures on the sleds. To avoid damage to people, scientific equipment, and traverse equipment travel was limited to ~ 5 km/hr (compared to usual travel speeds of 10-12 km/hr). We were unfortunate enough to also have encountered the sastrugi in flat light conditions limiting our ability to make detours around the sastrugi. Once stopped we experienced two storms that lasted a total of four days, with 30-65 knot winds that resulted in snowdrifts as high as 3m around vehicles and sleds. Forecasts provided by McMurdo indicated that we should expect at least one more storm after a short 24-36 lull between storms. We conducted as much science as possible and extricated the traverse line during the lull between the storms and began our 825 km return trip to Byrd. By this stage we had completed almost 90% of the traverse, and almost all of the science objectives. We decided that it was not worth pushing the traverse through poor conditions at the extreme limit of its distance from McMurdo Station. (1) Two Challenger 55s traversed a total of 1825 km on the main traverse and ~200 km of day trips. (2) Continuous radar observations (crevasse detection (400 MHz), shallow depth (400 MHz), deep (2.5 MHz)) were made over the 1825 km of the main traverse route and ~200 km of day trips. In addition, intermediate depth radar (100 and 12.5 MHz) data were collected over 200 km. (3) Six out of the original seven projected science sites were occupied for periods of 2-6 days depending upon workload per site. 1) only primary cores listed here. 2) 12 km from the original site 5 (new location determined from surface radar. 3) 50 km from the original site 6. 4) depth limited due to drill circuitry failure produced as a consequence of moisture penetrating circuitry housing during storm. A total of 771 m of ice cores were recovered utilizing both the 3" diameter Eclipse drill purchased by NSF for use by US ITASE and a 2.2" diameter lightweight drill built by Glacier Data for the University of Maine. 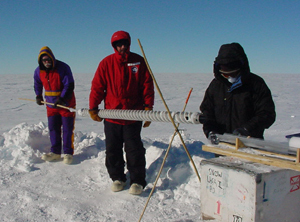 A total of seven 3" diameter ice cores were collected from six sites. Ice cores will be sampled for chemistry, stable isotopes, density and total b activity in lieu of snow pits. Permeability and porosity experiments were conducted from two snow pits and two 18 m ice cores were collected for this purpose. One more snowpit and an 18 m core were planned for Site 6 but were not collected due to conditions encountered at Site 6. Stratigraphy was sampled at sites 1-5 utilizing snow pits excavated either exclusively for this purpose, snow pits excavated as access for 3" ice coring, or ~10 m wide pits excavated using a Challenger 55. Twenty-one days of atmospheric and shallow chemistry observations were conducted at five sites. 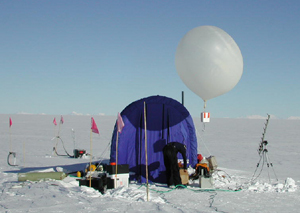 This sampling included real-time, continuous observations of peroxides (H2O2 and organic peroxides), formaldehyde and ozone near surface and ozone profiles up to an altitude of 23 km. 2"-cores (3 m length) from 3 sites were analyzed for H2O2 and HCHO on site using a continuous flow analysis melter system. Basic meteorological observations were collected at all sites and 10 m depth temperatures for comparison with infrared satellite estimates of mean annual temperature. Six high precision GPS 'coffee can' experiments were deployed to measure mass balance. The information presented below does not guarantee perfect US ITASE seasons in the future, however, it is intended to be an important step in the evolution of research style oversnow traverse capability. Several discussion items follow. They represent the combined thoughts of the members of the US ITASE 2001-2002 traverse. They are offered as a starting point for discussions with OPP/NSF and Raytheon concerning the 2002-2003 field season. Heavy Over snow Vehicles US ITASE operated with two Challenger 55s during the 2001-2002 season. Each vehicle pulled between 30,000 and 45,000 lb.. Both vehicles performed extremely well, requiring only routine maintenance (oil changes, filters, and steering alignment). The Challenger used during the 2000-2001 season required replacement of 3 bogie wheels. US ITASE was also fortunate to have two skilled mechanics on the traverse. One also served as Camp Manager. The addition of a second mechanic for this season was particularly valuable. (1) A second mechanic's position should be maintained for future US ITASE traverses. (2) The older Challenger should be fitted with factory available wider tracks to decrease vehicle ground pressure and increase access to tracks and under body similar to the newer Challenger. (3) The older Challenger should be fitted with a rear winch and cable, heavy-duty hitch, and counter weights similar to the newer Challenger. (4) The older Challenger should be fitted with a VHF base station similar to the newer Challenger. (5) Blockage problems for engine screens in freezing fog and diamond dust conditions should be investigated to prevent overheating and 1-3 km frequency stops to clear screens in fog conditions. This may be resolved through the addition of pusher fans or reversible fans. (6) Tooling will be required to change fuel settings for the higher altitudes encountered on the traverse to South Pole. (1) Berco 1 ("Blue Room") serves as a science facility (warm space for computers and wet chemistry preparation) plus berthing for up to 9 people. The Blue Room has a solar/wind powered 12 volt system with a bank of 10 batteries. (2) Berco 2 affords kitchen space. Seating for 14-15 is possible during special dinners, and up to 10 "comfortably" on a routine basis. The kitchen also offers berthing for 4 people. The kitchen has a solar/wind powered 24 volt system with a bank of 10 batteries. (3) Berco 3 was fitted at Byrd with a Polar Haven left over from the two previous US ITASE seasons. It provided space for work on mechanical, ice coring, and radar equipment, berthing for 3 people, and overflow space for dining. 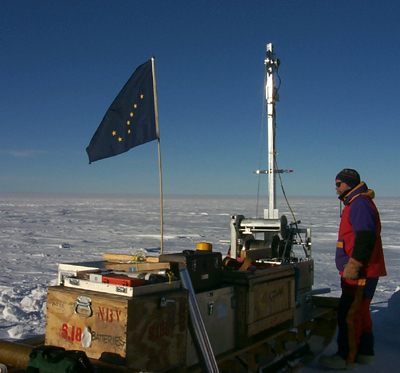 (4) Berco 4 provides space for 100+ ice core boxes (= 900+m+ of 3" ice core) plus some science cargo. 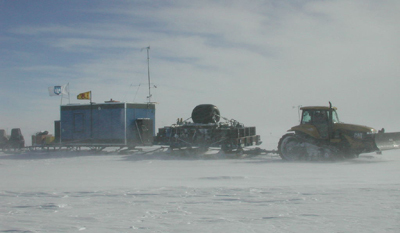 The new ice core freezer intended for the 2001-2002 season did not arrive in McMurdo in time for transport to the traverse necessitating burial of ice cores at each drilling site to maintain temperature and collection on the return leg to Byrd. 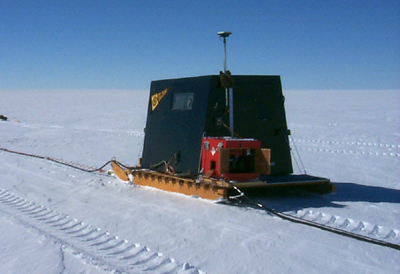 (5) The Alandaar sled loaned to NSF by Scott Base in 2000-2001 to temporarily replace a Berco not available at that time was used as a fuel sled during the 2001-2002 traverse. (1) The Alandaar sled proved to be an excellent, if not essential sled, carrying 50+ fuel drums, 6 100 lb propane cylinders, and various other items. We hope it will be possible to keep this sled for the 2002-2003 traverse. It is not clear that the Berco sleds could have transported this load. (2) Retain the Polar Haven mounted on Berco 3 as a workshop and berthing space. More ideally replace the Polar Haven with another permanent shelter that provides a warm workspace and berthing for four people. The additional berthing will relieve the crowded berthing for nine in the Blue Room. The Polar Haven was a last minute addition to US ITASE and proved to be extremely valuable. Its value will be even greater on the traverse to South Pole. We also suggest the addition of a two panel solar array, with two new 12 volt batteries to power an existing 1800 watt inverter. (3) VHF base stations should be installed in Bercos 1, 2, and 3 to eliminate the need for constant recharging of batteries in the portable VH Fs. While traveling it is essential that all sleds carrying people can communicate. (4) Addition of a fifth Berco for the coming season would aid greatly in the transport and recovery of fuel barrels and scientific equipment. Over the past three US ITASE seasons the traverse has been gradually streamlined to reduce the number and variety of sleds. One more Berco would allow further streamlining. If another Berco is not available another similar size sled from McMurdo is requested. (a) Place outside water melter in an insulated box (this could be the old black water box initially used in 1999-2000 to store water). (b) Replace the ships two-burner stove with a four-burner stove and oven to create more counter space. (6) Blue Room shelter requires some structural work and caulking after two seasons of traverse. (7) Cargo roller frames (20) are requested for the Berco sleds to aid in unloading T-3 and T-4 pallet assemblies from C-130s. Two snowmobiles were used during the 2001-2002 season. Both were older when first used by US ITASE in 1999-2000. (1) Two replacement snowmobiles are requested for 2002-2003. Considering the low temperatures to be encountered during the traverse to South Pole we would prefer to have either two Yamaha VK540s or two rebuilt Alpine II, but not Skandics. (1) Quantity 120, 55 gal drums of JP8 for the Challenger 55s to travel ~2000 km. During the 2000-2001 traverse fuel consumption was ~.75 km/gal. (an average of heavy loads and return light loads). The 2001-2002 traverse assumed .75 km/gal. plus ten extra drums. Using as a basis for fuel consumption the heavier loads towed in 2001-2002 and the need for small extra fuel supplies to do side trips an estimate of .6 km/gal. yield a greater margin of error for future fuel consumption estimates. In addition most of the 2002-2003 traverse from Byrd to South Pole will be uphill suggesting that .6 km/gal. should be a reasonable estimate for next season. (2) Quantity 22, 55 gal drums of Mogas for snowmobiles and five generators. (3) Quantity 12, 100 lb. propane cylinders for heating the Blue Room. Kitchen, and Polar Haven and for cooking. (5) Generators were used during 2001-2002 season for melting water, drilling, 24-hr onsite atmospheric chemistry measurements and radar experiments. One Herman Nelson was used for thawing motors. (1) The Mogas estimate for 2001-2002 was greatly in excess of the usage. A total of 10 drums of Mogas should be sufficient for 2002-2003. This estimate is based on 5 gal/day for melting the 20 gallons of water required by the team (total 250 gallons for 50 days), 150 gallons for other generators (ice coring, radar, atmospheric sampling), plus 100 gallons for snowmobiles. Total 500 gallons + 10 drums. (2) Assuming .6 km/gal. JP8 and an estimated main traverse length from Byrd to South Pole of 1400 km a total of 93 drums will be required for the two Challengers plus 7 spare for a total of 100 drums. Special Note: The 120 drums of JP8 handled in 2002-2002 and the 100 drums planned for 2002-2003 require considerable handling. 100 empty drums weigh a minimum of 5000 lb. and the drums are handled many times (e.g., loading onto aircraft, offloaded on ground or airdrop, at each airdrop site, shifting empty for full drums on sleds, retrograding). As a solution to all of the handling of drums we suggest that each Challenger have a sled dedicated solely to fuel. Each fuel sled would have a 3000 gallon fuel tank integrally attached to a sled. The tanks could be directly filled from LC-130 wing tanks reducing the need for any JP8 drums. If each sled tank contained 3000 gallons, each Challenger could travel 1800 km (assuming .6 km/ gal.). Challengers could be fueled directly from the tanks utilizing ~20 ft lines.Cost savings for the tank sleds could be substantial even in the first year of usage. In 2001-2002 it took 4 LC-130 flights to handle fuel. One flight to put-in fuel at Byrd to start traverse, two flights to air drop fuel and one flight to retrograde drums. Using fuel tanks only two LC-130 flights would be required.Labor would be greatly reduced by conversion to fuel tanks as noted above.Overall using fuel tanks versus drums would increase safety. At present fueling is done by people scrambling around on snow covered fuel drums that are several feet above ground on sleds. (3) Quantity 12,100 lb propane cylinders will be required for 2002-2003. (4) White gas supplies remaining from 2001-2002 will be sufficient for 2002-2003. (7) 18 volt cordless combination circular saw-screw gun-reciprocating saw. Two LC-130 fuel drops were dedicated to US ITASE in 2001-2002. A total of 25 pallets (4 drums of JP8/pallet) were air dropped at sites along the traverse route. The 109th ANG did a superb job of placing the fuel drops at sites planned for scientific activities. All drops landed exactly on target and the drums were in excellent condition. Airdrops most definitely provide an excellent way to avoid carrying large amounts of fuel and burning fuel to carry fuel. Airdrops will certainly be an important part of our plan for 2002-2003. (1) One Twin Otter flight for Byrd put-in crew (4 people) instead of an LC-130 put-in. (2) Two or three LC-130 put-in flights for cargo and science team. (3) One LC-130 air drop (2-4 sites) of JP8 (14 pallets of 4 drums each = 64 drums out of 100 total JP8 drums requested (36 drums of JP8 to be carried from Byrd). Not necessary if fuel tank sleds available for 2002-2003. (4) All retro for season can be accomplished utilizing return flights from South Pole. (5) Twin Otter time to be requested for GPS resurvey, end of season. (1) Pope Mobile tie downs for Komatik (shelter to sled & generator to sled attachments) require refitting and strengthening. It may be preferable to trade the current Pope Mobile Komatik for the 10 x 20 science/fuel drum Komatik to allow increased stability over sastrugi. This assumes that another Berco or similar sled will replace the science/fuel drum Komatik. (2) Empty drum and 2" ice core drill Komatiks require rear fixed tow bars and strengthened tie down sites. (3) Empty drum Komatik requires strengthening to avoid lateral movement and shifting of loads or replacement with a new Berco sled. (4) ATM shelter Komatik performed well on traverse. The Weather Haven serves well as a lab/work space but requires a Velcro window (.5m x .5m) to allow for enough light. The new ice core freezer planned for 2001-2002 did not arrive in McMurdo in time for transport to the traverse. Cores were cached at sites and recovered on return trip to Byrd. 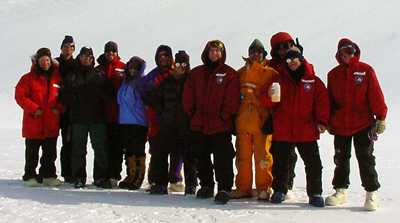 (1) Cold conditions during the 2002-2003 trip to South Pole alleviate the necessity for an ice core freezer. The primary drill used for the 2000-2001 and 2001-2002 seasons was the Icefield Instruments Eclipse 3 ice drill first used by US ITASE in 1999-2000. Overall performance was excellent with minor mechanical breakdowns. It offers notable logistic advantages that make it particularly useful for field traverse programs. It is lightweight and can be easily transported on a dedicated Maudheim sled, without complete disassembly. It takes a 3" diameter core and therefore requires fewer core boxes to transport and store the core than the standard 4" PICO drill. Eclipse ice core quality was excellent throughout all drilling depths making processing easier. ICDS supported valuable modifications to the Eclipse drill and provided a highly experienced driller.A new 2" ice core drill (Rongbuk) designed by Glacier Data was introduced this season. The Rongbuk drill was purchased by the University of Maine and utilized by several US ITASE projects. It was used in conjunction with the Eclipse to reduce time on site. Even in its prototype form the Rongbuk provided excellent samples in lieu of snow pits as well as shallow drilling to 20+ m.
Further modifications should result in the Rongbuk being capable of drilling to depths of ~100m. (2) Interest in the Rongbuk is large enough to solicit NSF support for a dedicated version. (3) Four 12 volt, 100 amp hour gel cells. (4) 100 foot 10 gauge extension cord with a four-plex box on the end. (5) 48 volt photovoltaic array and charge regulator for 2 inch drill. (6) Request to ICDS for a drill rescue kit to include 75m of 0.5" diameter synflex hose. A funnel, and glycol (propylene). (7) Control box and spare require weatherproofing to avoid wet circuitry problems encountered during storm at Site 6 that limited recovered core to 18m before system failure. (8) We estimate collecting 50 m cores from four sites and a 150 m core from Hercules Dome plus additional short cores to study b activity, chemistry, stable isotopes, permeability and porosity. Total number of ISC boxes required is 60 (with 3" tubes (45) and without (15)). This season the toilet was mounted on a Komatik, improving its durability and allowing it to second as an equipment sled. US ITASE had 2 Iridium phones, 2 HF PRC 1099 HF radios, four VHF radios and, one VHF base station. Daily communications were routinely accomplished with either the Iridium or 1099. Two Iridium phones were supplied by the Museum of Science (Boston) for transmitting daily logs for the US ITASE outreach program. The University of Maine provided one Iridium phone with a data link for personal and business use. (1) As noted in Heavy Sleds and Permanent Shelters 4 additional VHF base stations are requested. It is essential that each base station be equipped with a long antennae. (2) The VHF base station installed in the new Challenger requires a long antennae. 2000-2001 winter over equipment (vehicles, sleds, equipment) was stored on snow berms on Byrd Hill. (1) To reduce impact on South Pole Station in 2002-2003 US ITASE plans to stay 5-10+ km outside of South Pole at its last work site for the season. (2) US ITASE also plans to winter vehicles and sleds at this site. During the US ITASE 2001-2002 field season the field team participated in several outreach activities. These included: a Wednesday night lecture in McMurdo, news articles for the Antarctic Sun, biweekly live interviews with the Boston Museum of Science (1 November to mid January, entire team), daily updates via Iridium data link, and several contacts with schools located close to US ITASE institutions. US ITASE had a TEA assigned for much of the field season. However, the TEA was injured while in McMurdo and returned home. US ITASE is open to the addition of another TEA for 2002-2003, once the science and Raytheon team composition is determined by spring 2002.